An elegant starter containing seasonal ingredients that will impress guests at Christmas or any winter dinner party. 1. Preheat the oven to 190°C/ fan170°C/gas 5. Put the spinach in a large saucepan, in 2 batches, and place over a medium-low heat. Cook, stirring, until the leaves have just wilted. Drain and, when cool enough to handle, squeeze out the excess liquid. Roughly chop, put into a bowl and season well. Set aside. 2. Put the haddock in a frying pan with the milk. Bring just to the boil, then cover, reduce the heat to low and poach gently for 10 minutes, until just cooked. Use a slotted spoon to lift the fish from the milk and, when cool enough to handle, flake into pieces, discarding the skin and any bones. Transfer to 8 x 300ml gratin dishes or a 2.5-litre dish. Discard the milk. 3. Deseed the tomatoes and slice. Melt the butter in a frying pan over a high heat, add the tomatoes and sauté until softened and the cooking juices are reduced. Season and set aside. 4. Add the spinach to the dishes/ dish, followed by the tomatoes. Pour over the cream and top with the grated cheese. Bake in the hot oven for 20-25 minutes, until golden and bubbling. Serve immediately. 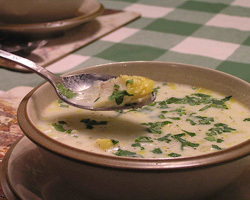 In a medium saucepan, melt the butter and sauté the shallot and garlic for 5 minutes, or until softened. Add the thyme and mushrooms and gently fry for 2 minutes. Stir in the rice until coated in the fat. Pour in the wine and allow to bubble for a minute or so. Add a ladleful of the stock, bring to the boil, then reduce to a simmer, stirring constantly. Add another ladleful of stock and stir again until absorbed. Continue adding more stock in this way until the grains of rice are plump and creamy. It should take about 15-18 minutes. Fold in the crayfish tails for the last few minutes of cooking, followed by the mascarpone and parmesan. Season to taste with salt and freshly ground black pepper and stir through the parsley. Grind the spices using a pestle and mortar or place in a plastic bag and crush with a rolling pin. Mix the vinegar, Tabasco, bitters and Worcestershire sauce together in a small bowl and stir in the crushed spices. Make 3 diagonal cuts on one side of the fish and brush with the spice mixture. Leave to marinate in a cool place for about 1 hour. Melt the butter or margarine in a large shallow pan until sizzling. 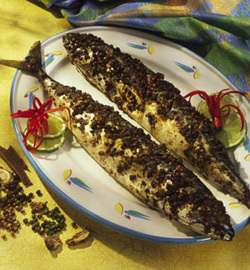 Fry the mackerel for 5-6 minutes until the spices have turned black. Turn the fish over and cook for a further 2-3 minutes. Garnish and serve with hot rolls and a crisp green salad.